We concentrate on our air conditioning during our sultry Florida summers, and focus on heaters only when temperatures start to drop. That can entice some Gainesville, FL homeowners to put off heating repair for a time; for example, to limp through the winter and worry about repairs before the next heating season rolls around. In most cases, this is a mistake. Here’s why you cannot afford to put off heating repair in Gainesville, FL. It boils down to stopping small problems before they get bigger, or to put another way, paying a little now to avoid paying a lot later. In many cases, a problem with your heater won’t necessarily shut it down; you’ll still be able to warm your home and “limp forward” until you can address the issue properly. The difficulty is that the faulty component – whatever it happens to be – invariably puts more stress and strain on the heater as a whole. That forces it to work harder to heat your home, which raises your monthly energy bills, as well as increasing the risk of another component suffering a breakdown as well. It’s not hard to see how this scenario will go. You’re invariably paying more to heat your home as long as the problem remains in place, charging a “deferment tax” in exchange for not contacting a repair person immediately. Add to that the potential of a much larger repair bill, as well as a shortened lifespan for various components working under the strain, and waiting for repairs may end up costing you a great deal more than addressing the problem directly. We all want to be frugal in these tough times, and that’s actually why you cannot afford to put off heating repair in Gainesville, FL. If you need to address a heating issue, call Touchstone Heating & Air to help you out. Don’t wait until next spring to handle your problems; pick up the phone and call us today, and save yourself money in the long run! It can come as quite a shock, especially on a hot day. “My AC is on, but hot air is coming out of my vents!” You don’t need to be an expert to know that something’s wrong, and when problems arise with your air conditioning, Gainesville FL weather can be particularly unforgiving. What causes an air conditioner to blow hot air? The obvious answer is that the thermostat hasn’t been set properly, or perhaps needs replacing. Beyond that, the possible causes grow more serious. Air conditioning systems depend on refrigerant gas cycling through a closed system in order to function as they should. If the unit is blowing hot air (as opposed to not blowing any air at all), then the problem likely lies somewhere within this system. For instance, if the compressor is malfunctioning, it won’t be able to turn the refrigerant gas into a liquid – a vital step towards allowing it to cool the air. The problem may also stem from a leak in the system, releasing refrigerant into the air. If too much refrigerant is lost, the process can’t work at all, and no cold air will be generated. You can spot this condition by the presence of frost on the evaporator coils: evidence of all the coldness that isn’t going into your home. In some cases, the problem may be caused by a leak in your duct system or somewhere similar. Leaks can pull hot air into the ducts while the air conditioner is running, substituting the cold air with warm air. Regardless of the causes, you need a trained expert to find a solution. The pros at Touchstone Heating & Air handle any problems you may have with your Gainesville FL home’s air conditioning system. Call us today to schedule service! Hurricanes. If you’ve lived in Florida for any stretch longer than a year, you don’t need a reminder of the No. 1 natural disaster threat we face in this state. Just as northern states face power outages from blizzards, down here we face losing power for extended periods because of the fury of high-speed tropical winds. Hurricanes are one reason you should consider a backup generator in Gainesville, FL. However, generators have more purposes than insurance against a natural disaster like a hurricane. They protect your comfort and convenience from regular power outages that can occur from heavy rains or during hot summers. A generator will ease your mind about your comfort during any part of the year. If you are interested in getting a generator, contact Touchstone Heating & Air. We install a number of whole-house generators and can find the right size one to power your home through emergency outages. This is where we need to emphasize the term whole-house generator. People often think of generators in terms of small, portable units. This is not what you want connected to your home. A portable generator is great to have in a car, while camping, or if you only need to power a single appliance or a laptop computer; but it will not power all your residential essentials. A whole-house generator, if sized correctly, will run all the important appliances in your home to give you the comfort and convenience you need: the lighting, the electrical heating system, the refrigerator, the air conditioner. You can choose a smaller system if you only want the essentials to work during an outage. You can’t simply a buy a whole-house generator on your own and expect to get it to work properly. It takes the skill of HVAC and electrical experts to pick the right model for you and to hook it up to your home’s electrical panel. You don’t want to discover that your backup generator needs a backup generator of its own when the power goes out! Look to Touchstone Heating & Air for quality selection and installation of whole-house generators in Gaineville, FL—whatever the season. 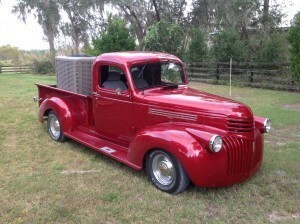 We recently had the pleasure of helping out the owner of this fine 1941 Chevy Truck. It’s a great flashback to the old days with a twist, we loaded a new HVAC system in the back! It’s great to see such a nice vehicle in such pristine condition with a great unit in the back, thanks so much!